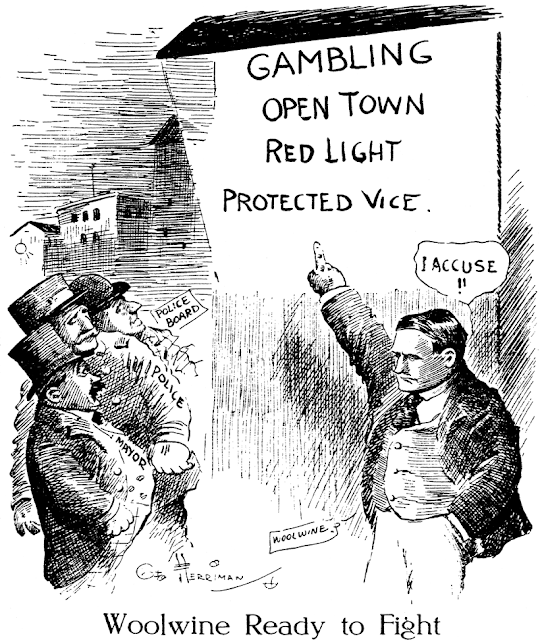 Friday, October 2 1908 -- L.A. chief prosecutor Woolwine is looking to topple the mayor. Among his well-founded accusations is that the mayor's police force allows and benefits richly from L.A.'s prostitution, drinking and gambling establishments. Lena B. Ellingwood was born Lena Bertha Cole in Milan, New Hampshire, on December 1, 1866, according to the New Hampshire Birth Records and the New England Historical & Genealogical Register, 1847–2011, both at Ancestry.com. Her parents were Lewis Hutchinson Cole and Emily Lydia Phipps. In the 1870 U.S. Federal Census, Lena was the youngest of three children. Her father was a lumber dealer. The Cole family resided in Portland, Maine. According to the 1880 census, Lena’s family was part of her maternal grandfather’s household. James M. Phipps was a farmer. Lena’s mother was a seamstress and her father an “agent for moving machine scythe grinder.” They were residents of Milan, New Hampshire. In the 1900 census, Lena and Charles, a job printer, had two daughters, Agnes and Marion. Their home was in Milan. The Ellingwoods were recorded in the 1910, 1920 and 1930 censuses in Northumberland, New Hampshire on Stratford Road. Lena’s husband was a real estate agent. According to the Harrison Cady tumblr blog, Lena wrote and Cady drew Cubby Bear for Comfort Magazine starting November 1915 and ending December 1931. At some point, Enos B. Comstock was the artist of Cubby Bear for Comfort Magazine. Lena wrote Cubby Bear for 25 years. In 1927 a Cubby Bear book was published and illustrated by H. Boylston Dummer. Other story books by Lena include Betty June and Her Friends, Belda in Blunderland and Little Black Pompey. The Ancestors and Descendants of Asa Freeman Ellingwood and Florilla (Dunham) Ellingwood (1979) said Lena’s husband passed away in 1934. Lena and daughter, Marion, were found in a number Berlin, New Hampshire city directories. The 1939 and 1941 directories listed them at 253 Main Street. Directories for the years 1948 and 1953 said their address was 168 Madison Avenue. According to Ancestors and Descendants, Lena passed away in 1964 and was buried in Milan, New Hampshire. An obituary has not been found. Comfort magazine was one of those really cheaply printed $1-per-year monthly magazines that existed mainly to sell rural housewives alcohol-based cure-alls, and miracle plant seeds to their farmer husbands. For your buck, you got twelve issues worth of badly written fiction, plus columns about anything of interest to the rustics, from female troubles to needlework to animal husbandry. Apparently from about the late 1910s on, you also got a monthly installment in the charmed life of Cubby Bear, a bear cub who gets involved in little adventures that teach the kiddies all about ethics, the Golden Rule, and how animals don't eat each other but love and cooperate with each other. Well, except worms. Unlike all the other animals in the forest, they can't talk. So it's perfectly okay to eat them. 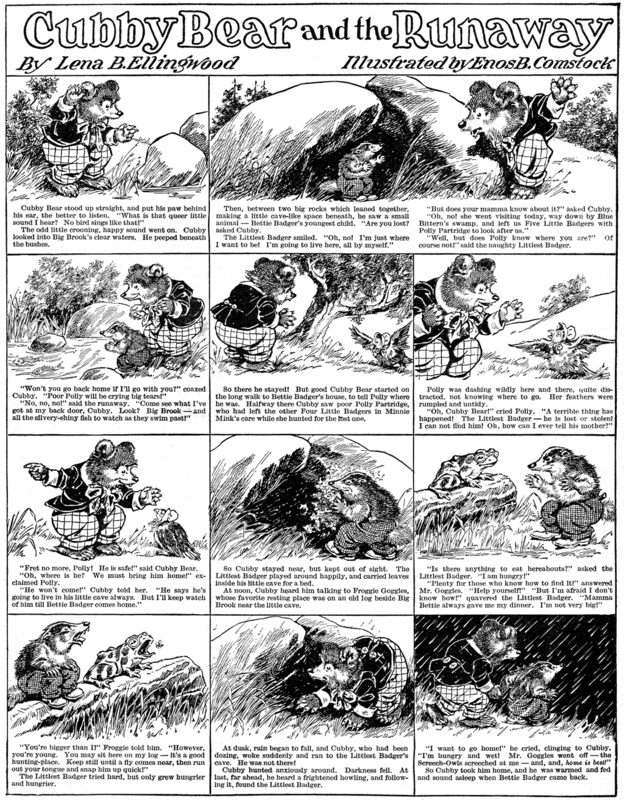 Originally the Cubby Bear series, which was written by Lena B. Ellingwood, seems to have been in the form of text story, accompanied by a cartoon by Harrison Cady. 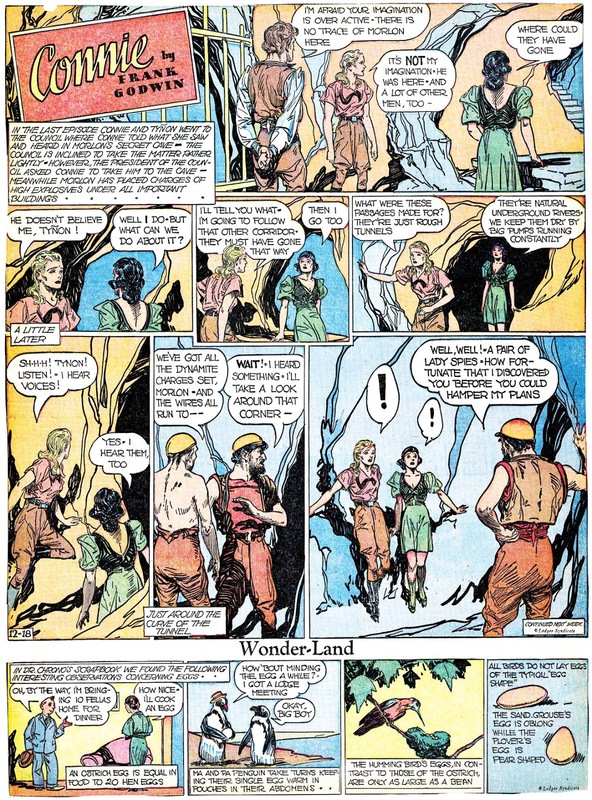 Later the feature changed into a comic strip. I don't know when that was, but I have a handful of examples here from 1938-39, and by then the art was by the very good artist Enos B. Comstock. I don't know when Cubby Bear was retired, and can't even figure out when Comfort magazine expired. This blog post says that Comfort ran from 1888 to 1942. That's the only thing I can find online, at least. 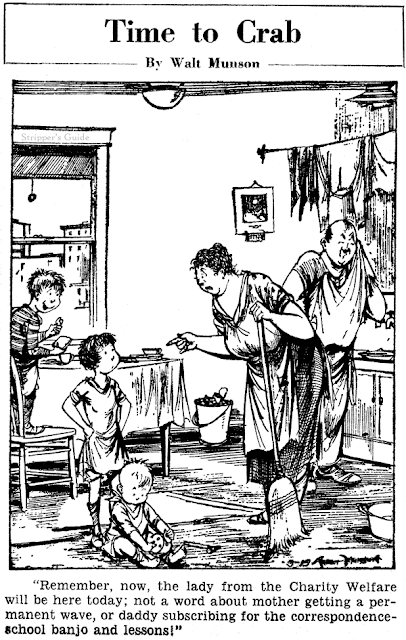 The animated Cubby apparently owed nothing to the comic strip, aside from a possibly coincidental name. Either the animated cartoon wasn't big enough to catch Comfort's attention, or Comfort wasn't big enough to make a legal issue out of it. It says he was renamed Brownie Bear for 16mm home distribution but appeared on early TV under both names, so there might have been a lawyer's letter at one point. The VanBuren company, even did a little licensing with Cubby, though it didn't help and he only appeared in cartoons about two years. The reason he had two names is that When VanBuren went belly up in 1937, all their films became public domain. The home use distributor (Official Films)changed the names and titles of the Van buren films, I guess in a bid to recopyright them, in titles they controlled. In early television, (Dumont's SMALL FRY CLUB in 1947 to be exact), the old VanBuren cartoons appeared first, and it didn't matter if the prints had the original or recreated titles, they were all PD. The VB package was a staple of inexpensive kid programming for years afterward. Walter Frederick “Walt” Munson was born in Waterbury, Connecticut, on October 4, 1897. His birthplace was recorded on passenger lists found at Ancestry.com, and his birth date is from the Social Security Death Index and U.S. Department of Veteran Affairs Death File. In the 1900 U.S. Federal Census, Munson was the youngest of four children born to Lewis, a brass finisher, and Anna. In subsequent censuses, Munson’s father’s name was spelled Louis. The family resided in Waterbury at 227 South Main Street. Manhattan, New York City, at 78 East 119th Street, was the home of the Munson family in the 1910 census. Munson’s father was a laborer at a plumbing house. At some point, the family returned to Connecticut. Information about Munson’s education and art training has not been found. The 1917 State of Connecticut Military Census said Munson resided in Waterbury at 177 Walnut Street. His description was single, 19 years old, five feet nine inches and 150 pounds. The Department of Veterans Affairs Death File said Munson served in the Navy from August 20, 1917 to July 15, 1919. An account of his service was published in Service Records, Connecticut: Men and Women in the Armed Forces of the United States During World War, 1917-1920. Munson has not been found in the 1920 census. American Newspaper Comics (2012) said Munson produced the panel, Such Is Life, which ran from October 1, 1923 to March 14, 1936. 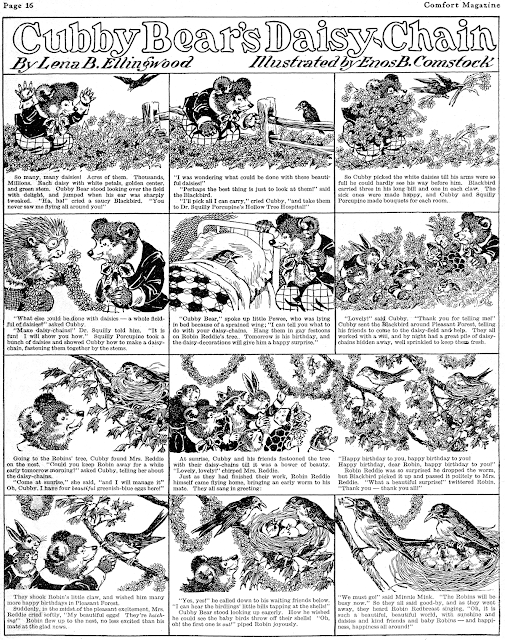 The panel also appeared in the comic book, Famous Funnies. Such Is Life was also known as Life’s Byways and Time to Crab. Another comic book product was Munson’s Dinky which appeared in Funny Pages. Munson’s sports cartoons appeared in the Brooklyn Daily Eagle. Munson visited Cuba in 1926 and 1932, and Bermuda in 1928. According to the passenger lists, he lived in West Haven, Connecticut, at 30 Washington Avenue. In the 1930 census, that was the address of his parent’s residence. Bachelor and cartoonist Munson, his brother, George, his wife and two children were in their parent’s household. The San Diego Evening Tribune, February 18, 1932, mentioned Munson in the column, “Looking ’Em Over with Skipper Redgap”. Walt Munson, ex-commissary steward in the navy, is one of the nation’s “big shot” cartoonists. He draws for a national syndicate, and contributes to many national magazines, including Our Navy, the leading publication of the naval service for the past 30 years. Munson was the only child living with his parents in the 1940 census. Their address was unchanged. 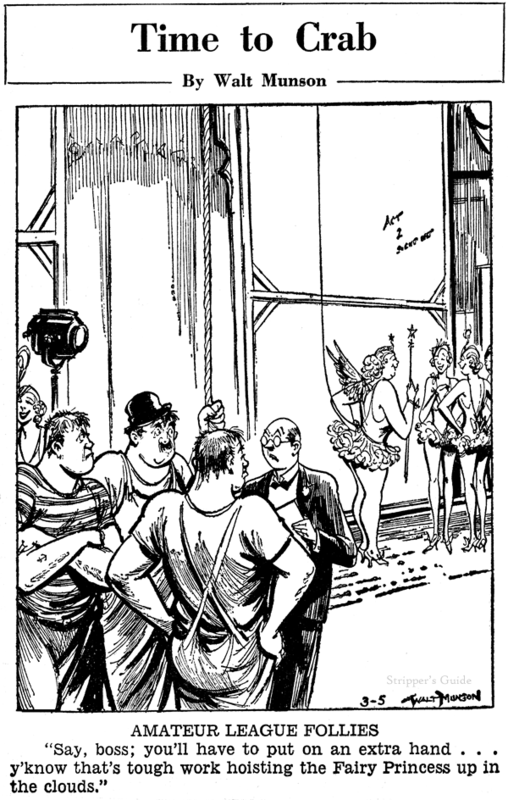 Munson continued as a freelance cartoonist whose highest level of education was the eighth grade. Munson passed away January 27, 1975, in New Haven, Connecticut, as recorded in the Connecticut Death Index. 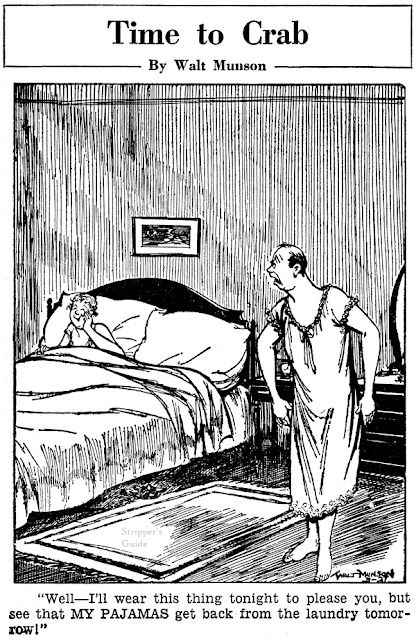 Walt Munson, a fixture at the Brooklyn Eagle, created a panel cartoon series in 1923 titled Time to Crab mainly for his employer, but it was also distributed to a small client list of papers by the Register & Tribune Syndicate. The Register & Tribune Syndicate, based out of the Midwest, found few takers for the panel, which was decidedly urban, not to mention urbane, in nature. Munson delighted in drawing tenement houses, street vendors, tough slum kids -- in short, not the sort of material best sold by a syndicate situated amid the cornfields of Iowa. In 1928, Munson switched syndicates to the Philadelphia-based Ledger Syndicate, where for syndication purposes, it was retitled Such is Life (the Eagle and some client papers stuck with the original title). The syndicate change might have seemed like a smart move, but Ledger's much better location was offset by their sales force's seeming inability to sell any of their wares to a substantial list of clients. Such is Life's client list did seem to get a little longer, but it still appeared in comparatively few papers. For readers, this might have been a blessing. Not having to contend with a lowest common denominator approach, Munson's cartoons on occasion comment honestly and unabashedly about society in ways that would have certainly had some editor somewhere up in arms. 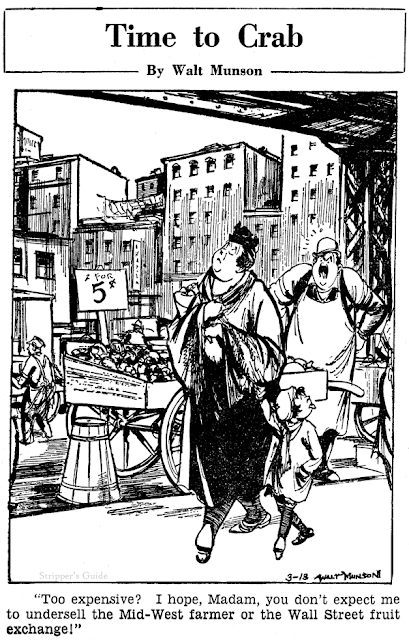 This became even more noticeable during the Depression, when Munson's New York City (for the city he drew might have been un-named, but it could be no other) was depicted as a pot full of haves and have-nots all stirred together and chafing mightily. Munson's run on the feature ended on March 14 1936. It was immediately dropped by the Brooklyn Eagle, but was continued in syndication by Bo Brown. 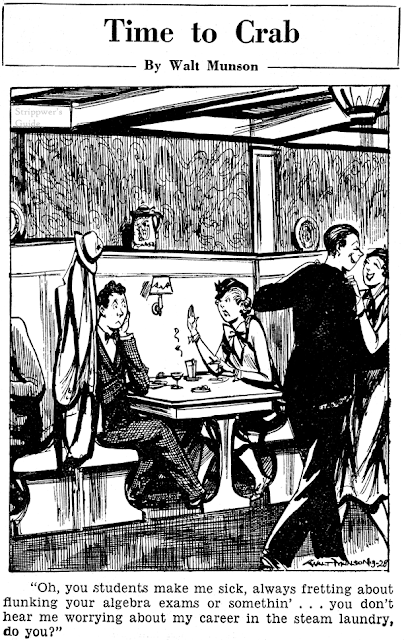 Brown was evidently on a one-year contract, because he jumped ship after precisely that interval, his last panel appearing on March 13 1937. Still not content to let the panel die, Ledger Syndicate go-to guy Kemp Starrett was assigned to the panel. This led to some lovely art on the feature, but it certainly wasn't seen by many folks other than readers of the Philadelphia Evening Ledger. Fourteen months into Starrett's tenure, the Evening Ledger itself dropped the panel on May 14 1938. Although the panel was advertised in E&P in 1939, I find it hard to believe that it was still being produced. Be that as it may, it wasn't quite dead in those late-1930s years, as Munson's back-stock had been sold off to someone, and was being sold in reprints to minor papers under the title Life's By-Ways. Funny name, "Time to Crab".